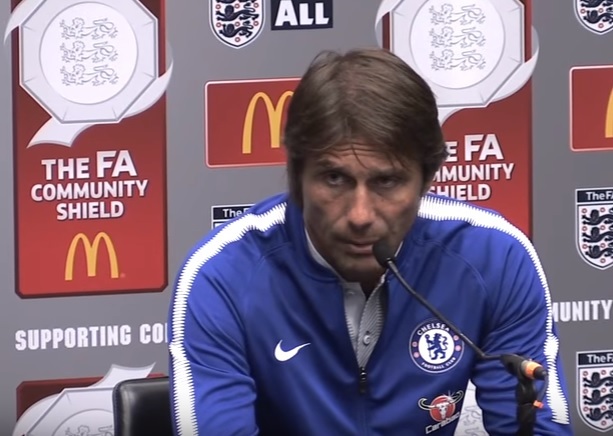 Antonio Conte once again voiced his frustrations at Chelsea’s summer business following his side’s 4-1 penalty shootout defeat to Arsenal in the Community Shield. The Italian has spent over £110million on Antonio Rudiger, Tiemoue Bakayoko, and club record signing Alvaro Morata, but his squad did not look particularly impressive at Wembley. “I have replied to this question. I hope in the future to have a different question. The Mirror claim he has identified Virgil Van Dijk as the next man he wants to come in, despite having Rudiger, Gary Cahill, and David Luiz in his position. Luiz shone against Arsenal, and if Chelsea found themselves short midway through the season, they could always recall Kurt Zouma from his loan at Stoke City. Liverpool remain the favourites for Van Dijk, with the Dutchman refusing to play for Southampton and being made to train alone by Mauricio Pellegrino. Buying the £60million-rated centre-back isn’t going to solve all of Conte’s problems. Diego Costa has still not left Stamford Bridge despite being told he wasn’t wanted at the start of the summer, and they have also been weakened by the sale of Nemanja Matic to Manchester United. It looks likely that they will miss out on Juventus full-back Alex Sandro, so Van Dijk would at least soften the blow amidst what has been a hit and miss summer.